Hey there i’m James and I’m in my 20s. At an early age, my interest in writing came through the form of poetry and song lyrics. I would spend many hours looking up to lyrics to songs i loved and learning what the message was behind them. It didn’t take long until i started to write my own poetry and song lyrics. That turned into my passion of playing a musical instrument. First was guitar which proved challenging but i eventually found my comfort zone in bass guitar. I also attempt to sing though i feel i’m not very good at it. My involvement with learning a musical instrument and writing went hand in hand as i created my own songs and even shared them with other bands. Over the years i’ve made a lot of great connections and made some friends with the same musical interests. A few years ago i found an ad online that said a magazine was searching for writers to review music and interview musicians. I sent out a mock article of one of my favorite bands latest albums. I was pretty nervous in waiting for a response but in time i got my reply and it was the start on my journey into music journalism. Here is a photo of one of my published articles in the first magazine i started out with called Indie Rock Magazine. 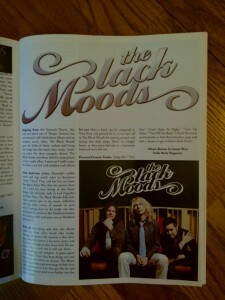 The article is a album review of a band called The Black Moods, it was featuring their debut album. I am now an established writer of 2-3 years over the course of that short time i have written on a new media website and contributed many articles to Indie Rock Magazine and Rock Thiz Magazine. Through the help and support of Yvonne Laughlin, i have gotten to move leaps and bounds in this short to talking with people like world famous producer Ryan Greene who has worked with Megadeth and Jay-Z, To Jimmy Allen, a founding member of early 2000s grunge band Puddle Of Mudd. Jimmy played a big role in songs such as Blurry, Shate Hates Me, and Psycho by Puddle Of Mudd. The list since then has grown and continues to as i write. This website is a stepping stone into writing more about what i love and expanding my musical horizons by reviewing other types of music and interviewing many of the talented musicians out there. As this site grows so will my skillset as a writer and as a musician. My hope is that all of the content here can be shared in a PG atmosphere, meaning everyone can enjoy the wonders of music as a family or with friends no matter the age group. So there is my story and journey thus far as a writer. I have my family and supportive friends to thank for keeping me motivated to get here and i hope that my articles prove to be a good read for all visitors as well. Thank you for checking out Contrast Control and keep on rockin!